Thanks to a pretty good skincare routine and diet, my complexion has come a long way in a short space of time, however there are those instances when you eat too much of a good thing for the first time in a while, or it’s that time of the month where your skin just breaks out – one big bag of nope if you ask me. Some sort of weird mentality takes over in this skin interval and you go all crazy trying to sort your face out until it looks normal again, but alas the more you mess and pack on the longer it can take for it to heal, so I’m stripping it back to make sure my skin calms those breakouts quickly and easily. Cleansing is always important to remove the dirt and oil from the day plus from the grime gathered at night as you sleep so I’ve been religiously using the MyChelle Fruit Enzyme Cleanser* which contains AHA to lightly exfoliate the skin and unclog pores, helping to remove excess sebum and encourage cell renewal to make those bumps and blocked pores get on their way out. Combined with the Konjac Sponge, my skin has been feeling more refined and clearer quicker which is fantastic! Now this is a time where I go all out on the face masks, as it stops you from aggravating the skin by squeezing and helps everything ease along naturally. I’m a huge fan of chemical exfoliants and switch between the MyChelle Fruit Fiesta Peel* and REN Glycolactic Radiance Renewal Mask depending on what strength I need – the MyChelle Peel is 3 minutes tops as it has a 7% acid concentrate so is more of a deep peel to plump and refine the skin, leaving it very fresh and new whilst the REN mask can be left on much longer (up to 15 minutes) and gently reveals the fresh new skin underneath as it busts out those dead skin cells and blocked pores. I switch between the two every other day if my skin is crying for help and it definitely helps speed up the healing process – traits of an impatient person. Another exfoliant based product but one that doesn’t seem to promote itself as one is the La Roche Posay Effaclar Clarifying Toner* which helps to tighten the pores but also contains some chemical exfoliant to just give that light refresh to the skin. I use this in the mornings when I’m feeling oily or need an extra clean if I’ve not used a mask, and it’s super gentle whilst meeting all its claims – just shame you can’t buy this product on its own. As well as using exfoliants, it’s important to make sure your skin stays balanced and nourished so I like to end my routine with something that’s going to keep my skin cared for during the day or night whilst helping to calm down the breakouts. When I’m having bumpy or oily skin, I always turn to the Clarins Lotus Oil which helps to combat excess oil production and provide nourishment at the same time, helping to keep my pores clear and skin soft. Hopping back over to masks now and I’ve constantly been keeping my eyes peeled for ones that will detox and clarify my pores, so when the breakouts do come I love to leave on a mix of Aesop Chamomile Concentrate Mask with the Sukin Detoxifying Clay Masque*. The beauty of these products is they are both designed to be left on the skin for long periods of time so you can effectively (on a weekend) leave this to do its thing for a few hours as an intensive treatment, especially as the Sukin mask is very creamy and absorbs oil whilst drawing out impurities and the Aesop mask calms and clears pores, making them a dream team at banishing those blemishes. Of course, I can’t do a skincare post without mentioning my all-time favourite skin saviour – Egyptian Magic. During a recent breakout, I used this every night either on its own or mixed with the Sukin mask, and by morning my blemishes and breakouts had faded, calmed down and started to heal up in super quick time – I have to remember to reach for this for future cases as the naturally oily and balms consistency of the product may feel like it is just smothering the skin, however the 6 natural ingredients work together to boost the skin in providing natural healing properties from Bee Pollen, Honey and Olive Oil – get absorbing that goodness! Finally, if you have one or two really raging breakouts that just need to be dealt with, make sure you have some Germolene at hand. Not the most natural product I know, but the antiseptic does keep any popped spots clean and can help reduce the risk of germs spreading from them to the rest of your face, pretty essential to get you looking fresh faced and fancy free in no time! There is always a way to strip back your skincare to the essential fool-proof products, and obviously use them in moderation – a chemical exfoliant every day will probably make your skin more sensitive but of course, it is your skin so whatever works best for you – so make sure you give your skin the chance to breathe and recover, to which you’ll be saying bye bye to breakouts in no time! 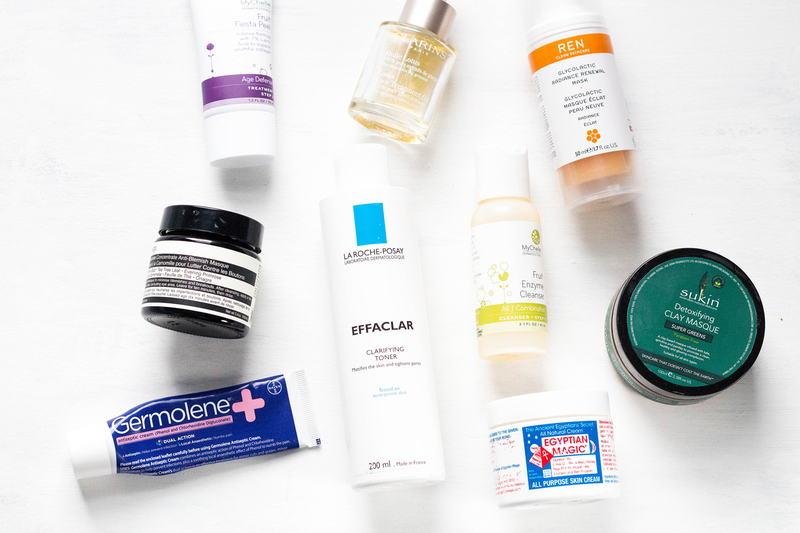 How do you deal with breakouts? 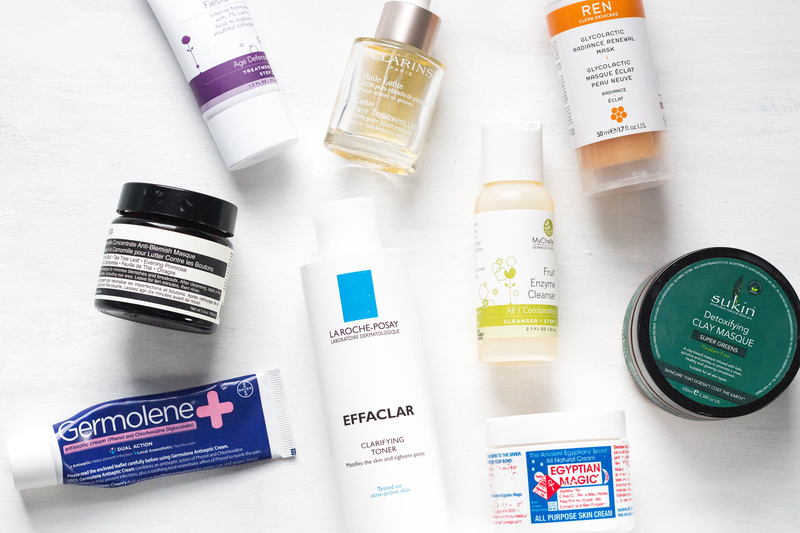 Have you found a holy grail product to banishing blemishes? 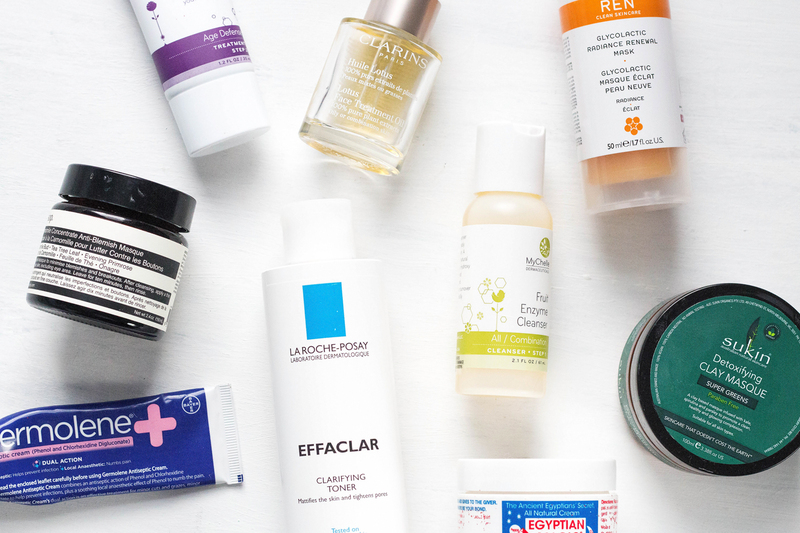 What is your routine for keeping your skin clear?